While HR professionals have long understood that people’s surroundings impact their behavior and performance in the workplace, this is the first study of its kind that quantifies the negative ramifications of hiring bad employees. The report, Toxic Employees in the Workplace, suggests that 3 to 5 percent of all employees are terminated for reasons to be considered “toxic” (e.g., misconduct, workplace violence, drug or alcohol abuse, sexual harassment, etc.) — but what’s more, these individuals greatly increase the likelihood of their co-workers engaging in toxic behavior, and even leaving outright. 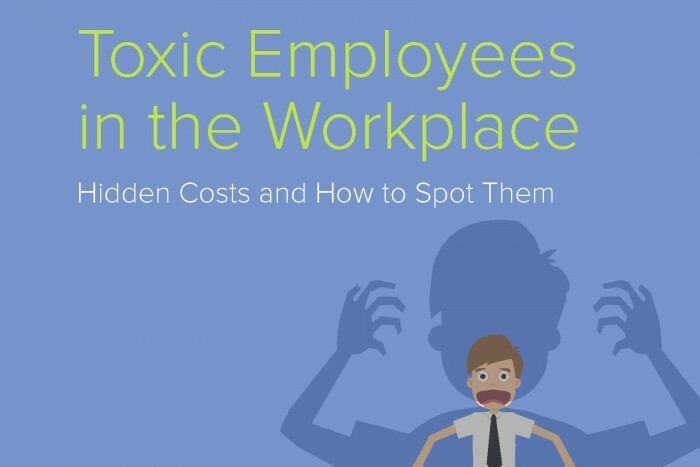 The study on toxic employees is part of our larger body of research on why the social fabric at work is just as critical to employee tenure and performance as the nature of the job itself. The “friendship effect,” as it’s called, looks at how the presence of friendship, or lack thereof, impacts workplace behavior. For example, we have conducted several studies revealing how friendship on the job carries significant, positive implications for employees, employers and organizations. Employees are more likely to quit if they have “toxic” co-workers. Based on data around team composition, our Toxic Employees in the Workplace study found that employees are up to 54 percent more likely to quit when the proportion of “toxic” team members grows by as little as one on a team of 20. Referred employees make better hires. A study conducted by Cornerstone in concert with the University of Toronto’s Rotman School of Management revealed that referred employees were 8 to 20 percent less likely to quit, and, in many cases, were less likely to engage in certain kinds of workplace misbehavior. In some industries, referred employees also showed higher productivity. Having friends at work is a positive predictor of someone’s propensity to remain on the job. In a study examining the social behavior of 20,000 employees, we determined that employees who knew three or more people working at their company were likely to stay at the company longer. Social networking is a strong predictor of success among employees. Another study looked at the effect of social networking on a large sample of employees working in frontline service positions, and found that social network behavior was directly correlated with productivity. Employees who regularly used up to four social networks converted more sales, handled customer service calls faster and stayed at the company longer than those who used no social networks. Trainers are more successful when they cultivate a relatively social and engaging classroom environment. In The Impact of Trainers, study, we found that trainers who worked to create camaraderie and friendship in their classrooms saw two to three times longer tenure among their employees compared to other trainers’ groups. An employee’s supervisor is the single biggest driver of their tenure and performance on the job. We followed 1,400 supervisors and 30,000 employees for another report, The Influence of Supervisors on Employee Performance, and discovered that an employee’s first supervisor at a company has the most dramatic impact on his or her performance even years later. The first employee-supervisor relationship is critical in terms of optimizing employee performance down the line. New big data technologies allow us to leverage vast amounts of internal employee data to measure the effect of social connections in the workplace. But the impact of this research goes beyond simply understanding how the “friendship effect” works within an organization. In the hiring process, HR professionals can use online, science-based assessments that utilize data analytics and intelligence tools to not only help identify which candidates are more qualified for a job, but which candidates are less likely to exhibit toxic behavior. For example, candidates deemed “highly qualified” by Cornerstone Selection are 19 percent less likely to be a toxic employee terminated for a policy violation. Big data analytics also produce insights that can help inform companies on how to create and optimize initiatives that promote workplace relationships and yield positive long-term results. Events like happy hours, community lunches and employee mentorship programs are just a few ways companies can foster more meaningful relationships between co-workers. Ultimately, evidence from data and analytics will help to ensure these programs are optimized to drive improved employee tenure and performance. Michael Housman is the Workforce Scientist in Residence at HiQ Labs where he mines publicly-available data for insights that allows large employers identify employees that are potential flight risks and take actions that will help retain them. Dr. Housman has 15 years’ experience utilizing data analytics to generate insight and working directly with stakeholders to put the findings into practice. Follow him on Twitter @MichaelHousman.